Improve Online Marketing with Google Analytics: Is Your Website Engaging? Is your website engaging? If you have some basic knowledge of how to use Google Analytics to measure your website traffic, you may still be wondering how you can use it to guide your marketing decisions. With so much data at your fingertips and so little time on your hands, knowing what to look for and where is vital to getting the most actionable information out of every minute you review the figures. What data should you look at, what does it mean, and what action should you take based on what you are seeing? Let's look into how Google Analytics can tell you if your website is engaging to your visitors in the second installment of our Improve Your Online Marketing with Google Analytics series. We previously discussed how changes in your website traffic can guide your online marketing efforts, but now we are going to dig a little deeper into what people are doing once they get to your website. Engagement is the active time a visitor spends on your website. Website engagement metrics are essential in assessing your website's ease-of-use and the value of your content. There are three main metrics to look at when deciphering if your website is engaging: pages/session, average session duration and bounce rate. So how can you quickly read this data for the purpose of pulling out actionable insights to improve your website, content, and online marketing results? Using the left-hand menu in your Google Analytics dashboard, choose Audience → Overview. From there you can quickly see all of your engagement metrics for any given period of time underneath your main graph. Remember, metrics alone don’t mean nearly as much as watching changes over time or when compared with the previous year. A bounce rate is defined as “a single-page session.” This means that someone lands on your website and never clicks a link or menu item to go to a second page. The higher the percent of your bounce rate, the higher number of your website visitors are only viewing one page of your website at a time. Curious about other Google Analytics lingo? 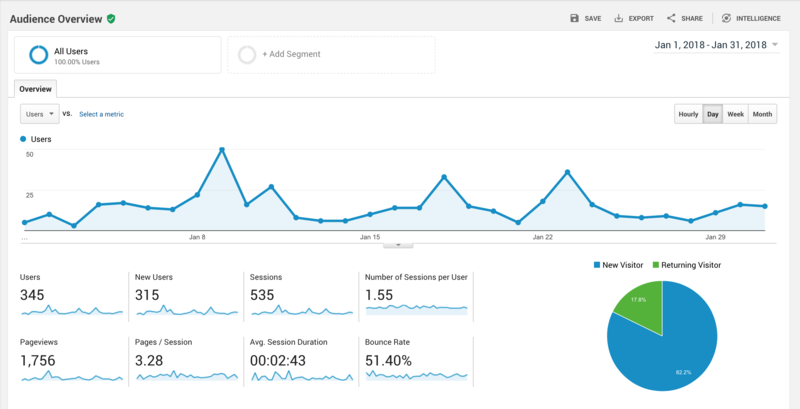 Check out our Getting Started with Google Analytics blog here. Today’s online marketing is complex and different for each industry so there isn't a single benchmark we can say you definitely need to be hitting. The variables that play into your bounce rate are vast and include your traffic sources (and quantity from each source), your industry, the device the visitor is using, the type of page they land on, and so forth. Therefore, if your best client is coming to your website from a Google Search ad, landing on the perfect landing page, completing the form for your service (or grabbing your phone number) and leaving, by all means, we’ll take those bounces all day long. On the other side of the spectrum, if someone uses Google or another search engine to find you via organic search using keywords while looking for the answer to a question in your blog post, they might read the entire page and leave. This again is not a terrible bounce to get, you’ve been established as the expert. Learn more about getting traffic to your website using blogs and other content marketing here. However, if you have set your blog up with calls-to-action (CTAs) to get visitors to click from one page to another, taking actions that qualify them as leads, but visitors are still bouncing from those pages, you need to reevaluate. If your CTAs are rarely being used – you may rework those CTAs. Additionally, if you have a visitor land on your home page from organic search, an ad, or another referral source and they continuously bounce rather than looking at your services pages, reading a blog, filling out a form or otherwise – then you need to make some strategic changes. Ideas for improving your bounce rate include: Make sure your website navigation is easy and intuitive for your buyer personas. Rework content to be more engaging, add exciting videos and images, hyperlink text where relevant to the logical next steps for more information, or add enticing calls-to-action for next steps or lead submission. Also look at your traffic sources and ad copy. It might be a matter of re-targeting ads to better match your target buyer, rewording ads, or redirecting ads to land on a better landing page. Remember: With such a large variety of industries, products, and traffic sources, one business's 90% bounce rate could be getting them more business growth than another organization’s 50% bounce rate. Pages/Session or Average pages per session are defined as the average number of pages viewed during each visit to the website. This is the total pages viewed, divided by your total visits. Basically, this is the number of pages your average website visitor reads through in one sitting on your website. What is a Good Number of Pages Per Session? This is a trick question for sure. Start by setting a goal of what you want visitors to do when they come to your website. How many pages stand between the first page a website visitor sees and the page you want them to be on? What action do they need to take to become a lead? What path do they take? Homepage – Services page – contact us? Landing page – related blog – contact us? Blog – related services page – contact us? Landing page - form submission? Or maybe your offering is more complex, and they need to go from the main services page to a deeper services page, to a photo gallery and back? What path would you take and what path do you want them to take? Work with your team to decide what a good goal is for you. Keep in mind, being diligent about linking your online ads on the most relevant pages will lower this number. But, for the sake of having a starting point, review your home page. This is where most website visitors will land first. Start by figuring out what the best route to conversion is and use that number as a goal to reach for. How Can I Increase My Average Pages Per Session? Similar to bounce rate, we can get more pages per session by giving visitors easy access to the important, related information we have on your website. This can be done with well-placed and strategic links in the body of your website. If you’re talking about a specific product in a blog or on the home page, link to that product page right when you are talking about it and add specific calls-to-action for it on that page. If you are talking about a project you completed for another client, link to that case study, gallery, or project page. If you mention a topic you covered in detail in another blog, link to it. Average session duration is meant to be the average time on site of all visits. But, in fact, it is not. Google can only calculate the time on site by time stamping when users go from one page to the next. Therefore, the time spent on the exit page is not counted, nor are the visits from those who bounce. That being said, this number is important to watch as a benchmark for your progress with content creation and website changes. What is a Good Average Session Duration? Think about average session duration like this, are your website visitors staying on your site long enough to learn about your services? Again, this depends on your industry and a slew of other varying factors. What pages are your visitors looking at? Reading blogs can skew the average session duration high, while clicking around product pages really quick or looking for a bit of data can lower time on site. A basic rule of thumb I have been following for years with the varying mixes of traffic sources, is that I want my total average to be a minute or more. Once I reach that target, I typically up my goal and keep working towards increasing the interest in my website. I also keep an eye on average session duration by source, to make sure it makes sense. That being said, if changes are made in ad targeting, big campaigns are released, or a particular blog post goes viral, I can anticipate the average session duration falling and won’t let it affect my strategy. Having a blog go viral brings in a lot of people who skim it and go and is worth the change in total AVERAGE session duration as those visitors represent a significant opportunity. How Do I Increase My Average Session Duration? Much like bounce and pages per session, average session duration can be improved with more engaging content. This can be in the form of great written content, great graphics that are relevant, or videos. (Newsflash: People don’t read!) People would rather watch a video – so try supporting all of your best content with a video that is the same information re-purposed in a new format. Check out our tips for mastering video marketing here. To be fair, this comes down to learning styles too. Some people are visual learners; some people are experiential and like to learn by doing; others read to learn. Build your content with all of their styles in mind, and visitors will come and stay. In addition to your content, your targeting for ads and search engine optimization (SEO) needs to be highly relevant to your buyer persona. If you are writing content for the wrong buyer, you’ll get the wrong site visitors who will not be interested. When it comes to website engagement, there is no singular benchmark to target. But, there should always be an effort to improve engagement with excellent site design, great content, and precise targeting. If you have any questions about strategic changes you should make to your website to improve these metrics, feel free to reach out to us, anytime. And stay tuned for more editions of Using Google Analytics to Improve Online Marketing.